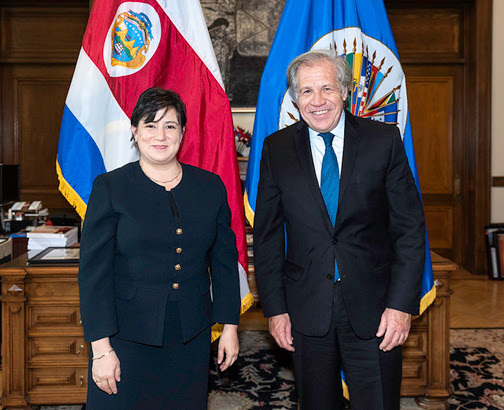 The new Permanent Representative of Costa Rica, Montserrat Solano Carboni, today presented credentials to the Secretary General of the Organization of American States (OAS), Luis Almagro in a ceremony in which she highlighted the importance of joint work between states to ensure a better future for coming generations. In her speech, Ambassador Solano Carboni recalled that her country "is historically committed to multilateralism and human rights and recognizes the value of political dialogue and consultation as essential elements for the peaceful resolution of conflicts." She added that the values promoted by her country "coincide with the pillars and efforts of the OAS." For his part, Secretary General Almagro highlighted the distinguished career of the Costa Rican diplomat, affirming that her solid formation is deeply integrated with the values of the OAS" and that as such "her presence will add to the work of the Permanent Council a deep knowledge and a firm conviction in the cause of human rights and democracy." Costa Rica is a founding member of the OAS that signed the OAS Charter in 1948 together with 21 other countries.